With a new three phase diagram i am here, in this post i am writing about ammeter selector switch wiring diagram in which i shown the complete method of ammeter selector switch connection with current transformer. I also write and published posts about ammeter and current transformers. And if you don't read our last post about CT coil and ammeter then kindly read these first. I provide post link below after also read tag. 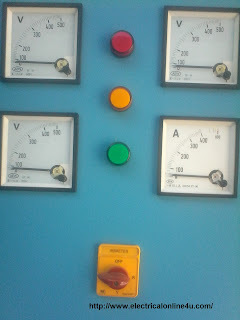 Now i am capture some images from an electrical panel board where the ammeter selector switch installed by my teacher Mr. Fazal Mana which have a big experience in motor winding and electrical panel board installation and making. In the below image a panel have only 4 places for electric panel meter installation and if we install the three meter for voltage testing then we have only one place for ammeter and we don't have place to install the three ammeters, so the ammeter selector switch make easy to test and measure the all phases L1 , L2 , L3 amperes with on panel ammeter by using the selector switch. 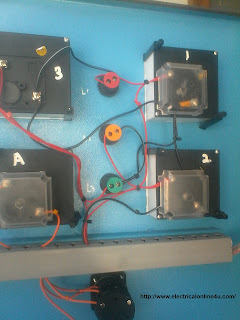 In the above image i shown the three voltage panel meters and one ammeter with selector switch, now lets see wiring connection image of these meters. 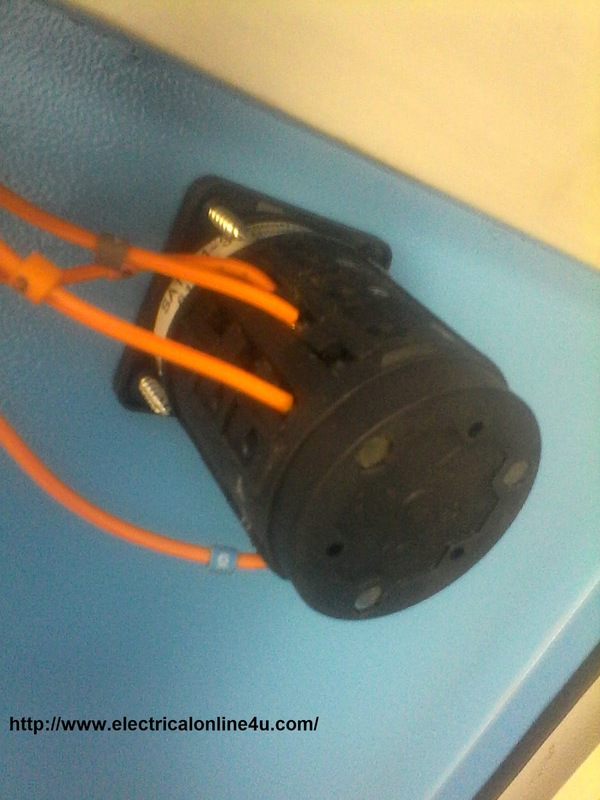 I know that wiring connection is not too clear to understand, however the reason of the image publishing is to learn about the method and wiring connection clearness. Now lets the back side of panel meter selector switch with wiring connection. In the above images i shown light indicator and voltage and amp meter wiring, so the below links help you to complete understanding. Before we start talking about the main diagram and main topic, first we disuse some things which is related with this post. I publish post about CT wiring and installation and you will learn my reading the below post. How to connect CT to Ammeter? How to wire a digital amps meter with current transformer? How to install CT coils for Three phase in Main Power panel board? So what is ammeter selector switch?, and why we use this for ammeter and ct coils where we can do this without a selector switch. As you know that we install three CT (current transformers) for measuring three phase ampere (load) and these three ct required three ammeters which show the amperes to us. So the ammeter selector switch is a selector switch from which we can do this work with one ammeter / ampere meter and we don't need to install three ammeters. The selector switch change the ct connection to amps meter. In the ammeter S switch we have 4 menu 0,1,2 and 3 and on the 0 point it's off and 1 side the switch active the first CT and on 2 the L2 CT and on 3 the selector switch active or do connection the L3 CT to ammeter. 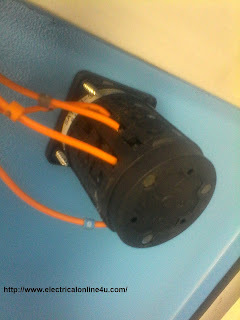 As you know that if we install the three current transformer (CT) coils for three phase, so connection method of this wiring is that to connect one one connection of all CT in one point which will be called Common Point. In the above diagram i shown the three phase four wire supply with three CT coils. In the selector switch connect the all CT Coils connection to R,S,T. and get supply From A1 and A2 for ammeter. Note that this ammeter switch front menu available in different names such as 0-1-2-3 , L1-L2-L3 and R-S-T. Note that in the above diagram i connect all current transformers one one wire with a point which i shown with earth symbol and if you don't connect this common wire to A2, the connection and ammeter will also work properly. This is too simple wiring connection and no need to explain more, however if i fond any image of ammeter selector switch which connection point shown clear then i will design another diagram. However the easy way to make own 3D switch image which connection contacts shown clear and When i done this, i will publish. Now i hope you understood this ammeter selector switch wiring diagram and IN SH ALLAH soon i will write about voltmeter selector switch wiring. if i want to add digital power meter, can i loop series s1 s2 from the selector switch?